Emerson College plans to renovate the theater while determining its future use. When the touring version of Broadway’s “The Book of Mormon” ends its run at the Colonial Theatre in October, the lights won’t simply dim onstage. The downtown theater, owned by Emerson College, will close for at least a year as school officials consider new uses for the venerable 1,700-seat venue. What the historic, richly appointed theater will become, and when, remains a mystery, with few clues and many questions. The stage preserved, but performances not necessarily part of the plan? “We are looking at various uses for the theater, including operating it as a theater, but that also suggests other options, of not continuing to operate it as a theater,” he said. On one point, there was no ambiguity. Tiedemann said the venue will not be used for student housing. 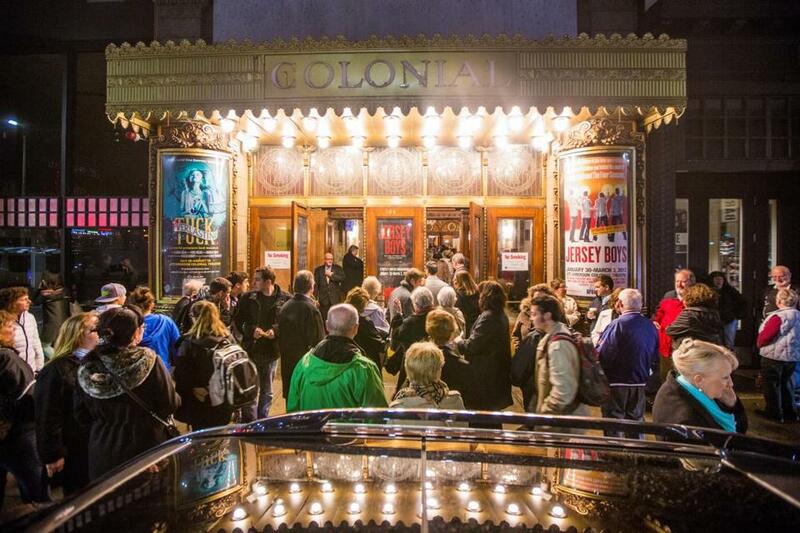 The Colonial, which opened on Boylston Street in 1900, is one of the oldest theaters in Boston. Adorned with colorful murals, chandeliers, and 5,000 square feet of glittering 24-karat gold leaf, it was last renovated in the 1990s. Emerson purchased the Colonial in 2006 and has leased the theater, most recently to Citi Performing Arts Center, which signed a three-year contract to operate it starting in 2012. Tiedemann said Emerson has been talking with consultants as it explores its options and plans to embark on much-needed repairs. He said the college had been thinking about repurposing the Colonial for nearly two years. Emerson has emerged in recent years as a major force in the city’s theater scene. It owns two other major downtown performance venues, the Cutler Majestic Theatre and the Paramount Center. It also operates a production arm, ArtsEmerson. All told, Tiedemann said, the college has invested $500 million on property acquisition and renovation in the Theatre District. “Emerson has an established track record of preserving historic theaters and historic spaces,” he said. But with an abundance of other downtown venues, including the Boston Opera House, Citi Wang Theatre, and Citi Shubert Theatre, not to mention the Calderwood Pavilion at the Boston Center for the Arts, in the South End, the question arises: Does Boston have more large theater spaces than it needs? “Commercial theater has not been as active in the Boston market as it has in the past, and that may be a factor in the various considerations that are going on within the Colonial today,” said ArtsEmerson founder and former executive director Robert Orchard, who now serves as a creative consultant for the organization. “I do know that it has not been used very much, and that’s troubling for the college,” Orchard said. News of the Colonial’s imminent closure came as a surprise to City Hall, where a representative for the mayor declined to comment on the situation because the mayor’s office had not been briefed on Emerson’s plans. Tiedemann, who stressed that the college “hadn’t made any decisions,” said Emerson has kept its plans close to the vest because the college wants to present various options to the public through dialogue. Tiedemann declined to elaborate on the renovations the college had in mind for the Colonial. This is not the first time the college has shuttered the Colonial. Following failed 2011 contract-renewal negotiations with Broadway in Boston (then known as Broadway Across America-Boston), the theater went dark for roughly a year before Emerson signed its current contract with Citi Performing Arts Center. That contract ends next month. But Spaulding said the college’s nonrenewal didn’t signal a breakdown in negotiations. “Absolutely nothing has happened that way,” said Spaulding.